This beauty, by Raise the Cake, is very similar to the cake I want for this year's Halloween party. Imagine the woman with a witch hat, the man with chains coming off of him (think the Canterville Ghost), bats flying around a moon...very simple yet so Halloween! 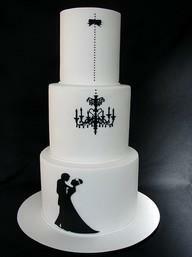 Kudos to Raise the Cake for such a lovely, elegant black and white design!